John F. Kennedy once said “There are risks and costs to action. But they are far less than the long-range risks and costs of comfortable inaction.” No doubt he was referencing running a government. However, this same perspective applies to personal career development. 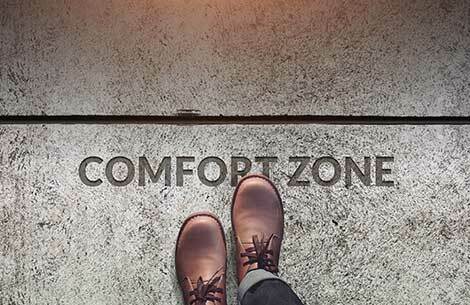 We all have our “comfort zones”. Psychologically they can be seen as space, movements, and people with which we are familiar, within which we feel confident and competent. Moving out of these zones takes motivation, but it does not need to be external motivation. If we adopt a mindset of “moving forward”, we can generate the momentum to do so. Most often a goal is visualized before it can be actualized. Internal motivational power can be fueled by the perceived advantage of taking action, whether it be to better the circumstances of ourselves or loved ones, more prestige, a better location, or something else. Opportunities can be made, not just stumbled upon. Networks are especially good for this, where information and problems (which can turn into opportunities) not available to the public, are shared. The satisfaction and camaraderie developed through networking becomes a self-perpetuating loop for churning motivation into possibilities. This is exactly why networking is so effective in uncovering emerging job openings, suggestions for educational advancement, and other career opportunities. The alternative is to remain complacent in a comfortable psychological space. But this comfort is deceivingly also subject to danger. In today’s fast-paced, ever-evolving society, complacency can lead to obsolescence and resistance to change. At the macro level, this can cause a company to lose its competitive edge. At a personal level, it can lead to lay-off as less expensive, younger employees with an eye on the future may become more desirable. It is important to remember that there is no job security. It has become a relic of the past.